Didn’t like the ending to Back to the Future 3? 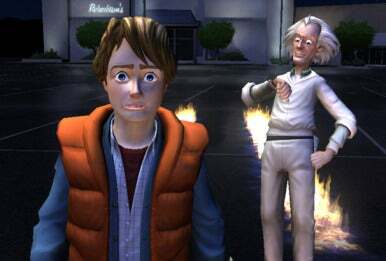 Well then you might like Back to the Future: Episode 1 from Telltale Games, as it rewrites the history of the franchise to provide room for the further adventures of Marty and Doc Brown. Power up the flux capacitor, it's time to journey into the past once again. The point and click adventure game, now available on Steam's digital distribution service, is likely to satisfy hard-core Back to the Future fans, but overall it’s not a complicated or very challenging puzzle/adventure game. In Episode 1’s alternate version of history, it appears Doc and Clara never married. The Delorean was never destroyed. Instead, at the end of Back to the Future 3, Doc apparently went back to 1985 with Marty. Shortly after his return, Doc took the Delorean to an unknown time destination and disappeared. The game begins in 1986. A Hill Valley bank, believing that Doc will never return, seizes the scientist’s land. They hold a garage sale to sell off Doc’s stuff. Marty attends the sale to make sure nothing dangerous gets sold. While he’s at the sale, the Delorean suddenly appears in front of him. Inside the time machine is Doc’s beloved dog, Einstein. Also inside the time machine are clues that Doc is in trouble sometime in the past. Marty, through research, deducts that Doc is stuck in jail in the 1930’s. If he doesn’t get out of jail, he risks being gunned down by the mad mobster Kid Tannen (Biff’s grandfather). So Marty suits up and goes back in time to save the Doc. In the ’30’s, Marty finds not only Doc, but a teenaged version of Emmet Brown. Marty partners with the teenaged Brown to get the older Doc out of jail—though of course Marty doesn’t tell the younger Brown his purpose, as that would create a universe ending paradox. The game is set in a 3D recreation of 1930’s Hill Valley. 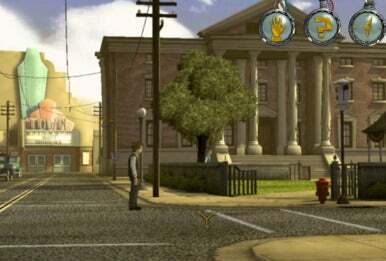 The game features Telltale’s trademark cartoonish graphics, combining realistic environments with exaggerated (and recognizable) characters. From Mart’s life-saver vest to Doc’s iconic hair, the key details are all there. Most of your time in game is spent wondering around the Town Square. You use a classic WASD control scheme to control Marty McFly and your mouse to interact with the square. Much of your time in the square is spent clicking on objects, or clicking on people that interest you, trying to find clues as to where to go next in the game. The game is oddly restrictive in where it allows you roam on the square. For instance, when you walk on some of the sidewalks boarding the square, you can only move backwards or forwards, but you can’t step off the sidewalks and walk in the streets near them. However, if you find a way off the sidewalks, you become perfectly capable of walking the entirety of the streets near them. Like many adventure games, most game characters and objects provide you with clues as to where you should go next in the game. Every time you interact with game characters, you get a list of questions you can ask them. Some questions lead to pointless conversation, while others lead to valuable information. Unfortunately, the game gives you little hint as to what questions you should ask characters first. You usually have to ask game characters a series of random questions before you get any valuable information out of them—which takes up a lot of time. Hill Valley Town Square doesn't really change much. The game makes a lot of references to the films, and so many of the challenges you have to solve are in someway related to the trilogy. For instance: In one game scene, you hold onto the back of a car that an armed Kid Tannen is driving. You have to figure out a way to disarm Tannen, but all you have at your disposal is a hubcap that looks a lot like a Frisbee. I really like this challenge, as if makes reference to both Back to the Future 2 and Back to the Future 3. I imagine a lot fans are going to find themselves having déjà-vu while playing the game—which might distract them from the fact that its puzzles are not very hard. The majority of the game’s puzzles are not brain busters—-Doc talks you completely through a couple of them, which isn’t exactly exciting. Though many of the game’s puzzles aren’t really puzzles— just problems you have to solve using step-by-step instructions— they can be creative. In one game situation, you have to help a young Emmett Brown create rocket fuel. While you’re helping the young Brown in his lab, his father calls for him from a nearby hallway. Emmett goes to his father, and gets into an argument with him. Unfortunately, the ingredients to the fuel must be mixed in a timely manner, or else it won’t work. So, Emmett uses double entendres in his arguments with his father to give you hints on how to finish the fuel. I find the entendres especially creative, and I can tell that the developers put a lot of time into coming up with Emmett’ speech. Overall, the game’s nostalgia factor is off the charts and its reverence for the trilogy is its strongest asset. The game’s environments are perfect recreations of the ones seen in the movies. Doc’s laboratory has all the equipment in it that you would want to see, from his imperfect model of Hill Valley, to his Rube Goldberg dog feeding machine, to the his stellar amplifier. The game’s programmers must have paused the movies a thousand times to get all the details of the lab right. Though the only game character voiced by his original actor is the older Doc (a shout out to Christopher Lloyd for doing an excellent recreation of his most famous character), you wouldn’t know it. All the game’s voice actors do great imitations of the actors who originally played their characters. The most notable imitation is done by the man who plays Marty, AJ LoCascio, who does an almost perfect Michael J. Fox. Before I checked the game’s credits, I was almost convinced that Fox was voicing Marty. Episode 1’s plot relies a great deal on the recurring themes of the movies. Once again, a member of the Tannen family is the villain. Once again, a member of the Strickland family puts up an obstacle for Marty. Marty must once again convince a younger version of Emmett Brown to help him. The Hill Valley Court house even plays a role in the game. If you’re a Back to the Future Fan, I am sure Episode 1’s strong sense of the trilogy can easily get you through it. The game is really meant for the nostalgic, as it has plenty of goodies to entertain fans. If you’re not a Back to the Future fan, you may find its puzzles creative, but you won’t have the cloud of fandom to cover up the fact that the puzzles are not very challenging. Back to Future: Episode 1 is the first part of five part series, with its next part due out sometime in February. I hope the next installment is more challenging.